For this year's annual Women of Beer collaboration brew day, the Aussie ladies got together at five different locations to brew five different beers. As you can read in our article "So Much Pink" on the brews elsewhere on the site, there was a recipe drawn up by the Pink Boots Society for each brewing group to follow. Two of the five groups followed the red ale recipe closely, whereas there were three variations on a theme. The variations included the use of Zinfandel grapes in WA, where the brew took place at the Young Henrys Beer Farm, the crew at Young Henrys in Newtown added spices, while at Two Birds in Melbourne the result was an imperial red ale brewed with hibiscus, an ingredient that has worked so well in the past in beers like Shenanigans Red Sky IPA. According to the Two Birds brewers, which included representatives from Red Hill Brewery, Two Row, Beer Diva, Mountain Goat and Little Creatures: "It has dense layers of toffee malt characters (courtesy of malt donated by Gladfield Malt in NZ), with berry-like notes from the Bramling Cross and New Zealand Cascade hops, floral notes and a vibrant red hue from the use of hibiscus petals." 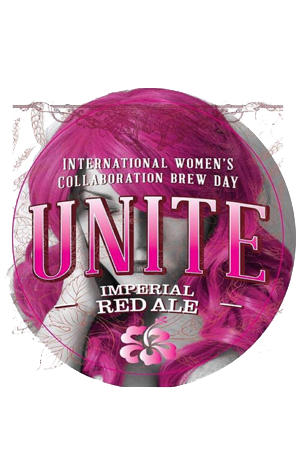 The profit from the brews will be donated to the Pink Boots Society Australia, an organisation started to inspire, encourage and empower women beer professionals to advance their careers through education and has over 1800 members worldwide.